Adventure Kartel is an intellectual property created by Ashley Wood and TP Louise that consists collectible figures and artworks. In the universe, Adventure Kartel is the name of a team of misfits and oddball characters lead by Tommy Mission and Fighting JC who have to fight against Zomb MD. 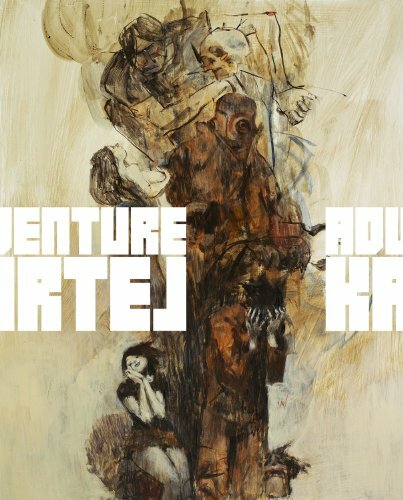 Adventure Kartel the book collects the mini-comics and oil paintings created by Ashley Wood for the characters. It's a huge hardcover, almost A3 size. The gigantic size is looks impressive. The book starts off with a ten-page comic that introduces the premise, and then it's followed by the characters being revealed one by one. There's not much of a coherent narrative as you just get bits of the story with each character. And the language is full of slangs and curse words. "Wanna go on some sh't hot adventure? Well, do ya?" The highlight of the book is Ashley Wood's style of art. There are his characteristic rough strokes, the halftones and in this particular book the use of very toned down desaturated primary colours of yellow, red and blue. With the large page sizes, those mini comics and posters can actually fit onto one page and you can still read whatever words that are on it. The overall feel is somewhat casual, loud and spontaneous, just like artworks you may have seen in other Ashley Wood artbooks. A few Adventure Kartel characters have been released as collectible figures under the company ThreeA. And some of the artworks in this book are seen in the posters that come with the figures. A lot of other characters are not featured so I suppose there might be another book in the future. This book is going to appeal specifically to fans of Ashley Wood's art and Adventure Kartel. Because it's quite a pricy, I recommend at least flipping through before purchase. If you like this style of art, you might want to check out the book Visual Funk: Jim Mahfood Art also. That's an A3 size watercolour pad by the side.